Cell phones or mobile phones have become a very important part of our daily lives. It is very difficult to imagine our live without a cell phone as most of our work is done using cell phones. Everything has its pros and cons and mobile phones too has its positives and negatives. 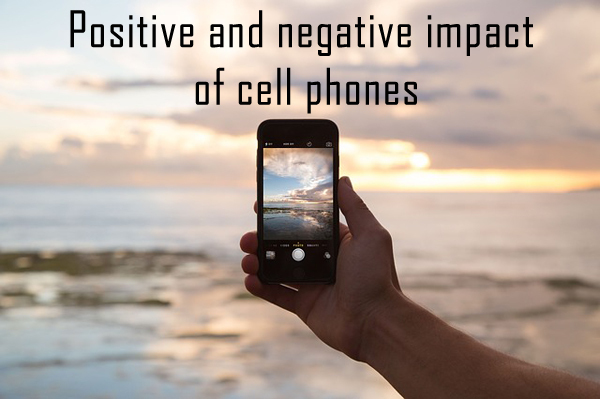 If you are wondering what positives and negatives can be of cell phones, you are at the right place as today we will share these with you. The very first positive point of mobile phones is communication. With mobile phones you can communicate with anyone from anywhere at any time. Now days, the smartphones which are coming are small in size and light in weight which makes it very easy to carry them. You don’t need to sit beside the receiver as your mobile phone is not attached with anything. Mobile phones have become a source of unlimited entertainment. The things which we never thought would be present in a mobile phone are now possible. Smartphones have come into existence which not only help you in making calls but also help you to stay entertained by allowing you to play games, listen to music and do lots of other stuff. Mobile phone even come with special apps for kids to increase their brainstorming which is pretty good. If you are using a smartphone, you can take advantage of it in your studies or your business. The smartphones which come with Android, Apple iOS and Windows Phone operating system come with educational apps which can be used while you are in college. If you are into business you can install applications like Skype which will help you in communicating with your clients on the go. Let’s have a look at negative impact of cell phones. It is true that mobile phones can help students in studies but only if they use them wisely. Most of the students become additive to mobile phones and are found playing games, chatting with their friends and watching movies and other stuff. If students are busy keeping their eyes on their mobile phones at all times they won’t get time for studying which would lead to poor grades. Mobile phones lead to a lot of accidents. A lot of people do their daily work, drive while taking on mobile phones. There is high risk of accident if you are talking on the mobile phone and driving as you are giving your half attention to the mobile call and are having half attention on the road. Research studies have also claimed that mobile phones have a negative impact on health of an individual. If you are using mobile phone for long hours daily it might lead to serious health issues. These were the advantages and disadvantages of mobile phones. In the end, it all depends on our usage. Cell phones are the most personal device to us and we should make an optimal use of them. What are your views regarding the same? Share it with us using the comments section below. 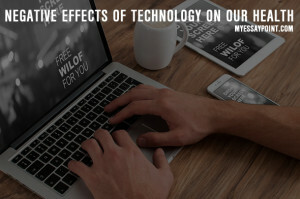 How technology negatively affects our health? Apart from studies, it helps in communicating with your friends and family. The best thing I love about cell phones is that its quickly becoming all in one solution to our most needs. We don’t need a watch, alarm, calculator, PC, camera, torch and what not. The future is going to be more amazing with lot of advancements in cell phone market. why are you calling him bad? Yeah agree! same here. In my perspective every thing has two side advantage and disadvantage same mobile phone but it has more advantage than disadvantage. Because it has more positive implications on our daily routine. Example by using windows mobile phone we can able to use it’s performance as computer and do all our task so easily without big machinery ( Computer) . So we can say mobile phone has playing crucial rule in our daily routine and without using it we would get back from our works. It is a good essay ,i needed it , i’m a student thanks…..???? In my opinion, Mobile phones have thier PROS and CONS towards students as well as the youth but i think Mobile Phones have made our daily lives become more easy as there are a lot additional featured on them. I’m an Iphone user and it gives me a lot benefits in carrying out my daily tasks given by teachers. In fact, it has assisted me to gain more knowledge and information about daily issues and finding a good essays for my ENGLISH assignment and its totally worth it to have a kind of sophisticated mobile phones. 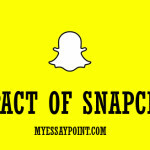 In deed, the benefits and drawbacks of all technologically advanced devices depend on their users. it is an undeniable fact that these devices are more frequently used negatively as compare to their positive usage. the reason behind this, i think, is the immaturity and lack of proper guidance. moreover, easy excess to the bad websites have too played their unnecessary role. I just want to Say that things either use or misuse is totally depending on you . how much time you spend on that is may vary individual to individual so its totally a personal but yes limited use this may help to seek more benefits fromthat. Hi. I’m student of IELTS. If u r interested to improve both os us E by conversation below is my Skype ID. As for me, I will like to state categorically that cell phones pros and cons depends on individuals involved. One either uses it to benefit him or to his detriment. But I believe the advantages out ways the disadvantages. However, I will like to ask if anyone could enlighten me more on the effect (negative) of the cell phone on students’ performances in their final year exam. Thanks..for giving such info abt phones..it helps in my project..it too useful for project..
Well, that’s an extreme example you have given. It does not happen everyday, so I don’t think you can criticize technology for silly mistakes of people. thanks its good example for me to writing essay.god bless you. 1) Luckily, I had been watching. I was walking north on a sidewalk, preparing to cross the road on a green light. A car traveling south decided to make a left hand turn into my direction. I saw that the driver was on her phone & didn’t see me, so I stopped walking when I was 1/4 of the way through the crosswalk. The driver did not see me until her car was right in front of me and I was able to look at her through the front passenger side window. She freaked out when she saw me as she knew what she had done. 2) I actually remember life pre-mobile phones. Now that people know that I have one, people expect me to always be available. It seems to be a crime of I don’t reply to a text, call, email or social media post within 30 minutes, or less. 3) When I had a landline, I purchased a nice home phone that worked perfectly fine. After using that home phone for 9 years, I ported my number to a mobile phone. Now I feel compelled to upgrade my phone every couple years to keep up with the technology…and good mobile phones are NOT cheap! I don’t like that it is now “normal” to spend $100s on another phone every couple of years or risk having your current mobile phone become obsolete. 5) Injuries. Outside of possibly being hit by a driver who’s on their phone or hurt by someone who purposely hurts you to steal your phone, people can injure themselves. People bump into each other, they are tripping & falling, step into the road without looking (and sometimes die for stepping in front of a vehicle, there’s carpal tunnel syndrome, eye, back and neck strain, etc. 6) Anti-social behaviour. Instead of talking to the person sitting across from you at the dinner table, you’re talking to the person who didn’t/couldn’t show up for dinner? 7) Cheating. I don’t necessarily mean cheating on a loved one, but cheating at school. After graduating from university, I went back years later to take some night courses. My university had problems with cheating. We used to be able to use any calculator we wanted for the accounting classes, but now, there was 1 particular calculator that could be used which was only available at the university bookstore. Students were programming entire textbooks and/or notes into their phones. Also, students were cheating by texting each other, taking pics of the tests/exams so share later on, jumping online to find answers, etc. 8) There are many organizations that automatically assume that you have a mobile phone. I went into a Home Depot the other day and there were no flyers. Where the flyers should have been was a sign that encouraged people to jump online to view the flyer. In other words, I now have to use my data in order to see what the store is selling? And what about my mom and dad who don’t have cell phones with data plans? What should they do? 9) I went into a mall the other day and instead of seeing a mall directory I was encouraged to scan a QR code so I could use my phone to navigate the mall…and there was no mall Wi-Fi! I have more, but I’m going to stop now. 10) Now that many people now use mobile phones, pay phones are quite rare. I’ve had people ask me if they can borrow my mobile phone because they could NOT find a payphone anywhere. I try to be the nice Canadian, but I don’t want to hand my phone to a stranger. Also, there have been times where I am riding the subway system and a train delay occurs. Mobile phones don’t work underground here in Toronto, if I want to call work to say I am running late, I need a payphone. With so few payphones, this is when the lineups become ridiculously long. I actually have more, but I’m done typing. Very well put LizT. Thanks for sharing your opinion. I agree with LizT 200%…..unfortunately nowadays everybody give up his brain for the cell phone’s brain!!! Ausumn essay..it helped me a lot in writing my article.!! Thank You Soo Much For This Essay,I was preparing for an ASA Test in school nd this is one of the best infos I’ve got…………………. Yeah I agree .it is depend on our usage. Without a cell phone can we see this ?? Though it is bad ? but donot destroyed any one. People they destroyed them self by making all those technology. It was all diffidently right, and I really like it….. It gives me a clear knowledge about phone…in which I have a big doubt.